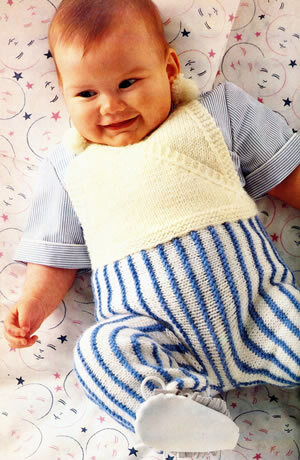 This is an adorable romper; the stripes are created by knitting garter stitch ridges sideways using contrast yarn. Pom-pom ties are used as fasteners at the shoulders. After last months picture of the Andy Pandy puppet, how could I resist making this outfit. 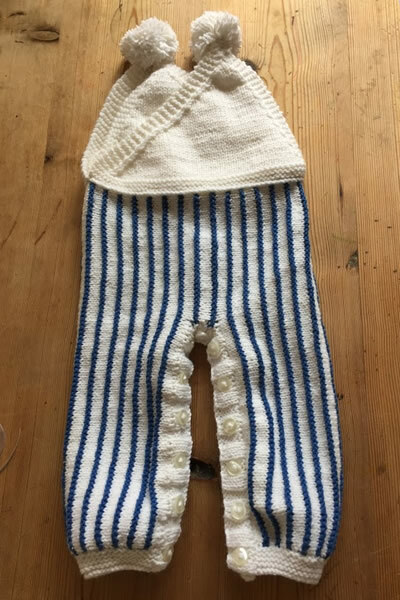 The romper is easy to knit, though - like exam questions - make sure you read the pattern and understand the pictures of the pieces clearly before you start. Garter Stitch: every row knitted. Stocking stitch: 1 row knit; 1 row purl. Striped pattern: 4 rows in white in stocking stitch, 2 rows in blue in garter stitch (both rows knitted). Repeat these 6 rows to form the stripes. This section is worked sideways in one piece up to the armhole. Dotted lines in picture show the centre sides and the ankle borders. Using 3mm needles and white yarn (A) , cast on 34 sts and knit 3 rows of striped pattern. Continue in striped pattern, shaping waist by decreasing 1 stitch at the beginning of the 9th and every following 10th row until 77 sts remain. Work straight until leg measures 23cm (9 inches) from the beginning, ending with wrong side facing. 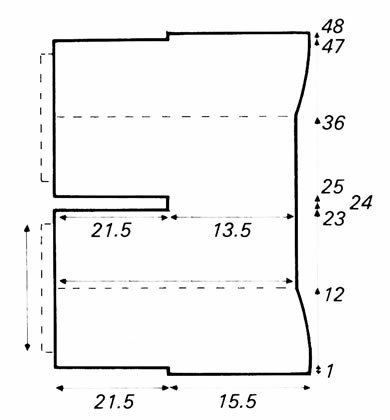 Work straight on these 30 sts for 2 cm (¾ inch) ending with wrong side facing. Work straight until section measures 36 cms (14¼ inches) from the beginning, ending with right side facing. Start shaping the waist again by increasing 1 stitch at the beginning of the next and every following 10th row until there are 81 sts. 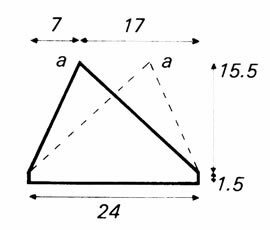 Work straight until section measures 47 cms (18½ inches) from the beginning, ending with wrong side facing. Work 2 rows stocking stitch in white (A). With 2½mm needles and white yarn A, knit up 70 sts along lower edge of leg. Now work in garter stitch for 2 cm (¾ inch). With 3mm needles and white yarn A throughout, cast on 53 sts and work 1 cm (½ inch) in garter stitch. Next row (right side): Knit. Next row: K4, purl to last 4 sts; k4. Next row: K4, SL 1, k2tog, psso, knit to the last 6 sts; k2tog, k4. Repeat these last 4 rows until 11 sts remain. Next row: K2, p3; k2. Next row: K2, p1; k2. Work as for Left front. Next row: K4, SL 1, k1, psso, knit to the last 7 sts; k3tog, k4. Rep these last 4 rows until 11 sts remain. Work as for Right front. Join centre back seam and leg seams. Placing left front over right front and right back over left back, sew bodice pieces to trousers. Make twisted cords and small pom-poms, and attach to shoulders for fastenings. 22sts x 38 rows to 4 ins in over garter stitch pattern on 3mm needles. Use smaller or larger needles to obtain the correct tension. Instructions given for age 3 months. k2tog/k3tog: knit 2 or 3 sts together. yfwd, k2tog: yarn forward - bring the yarn to the front of the work and when you knit the following 2 stitches together, you will have created an extra stitch, in a way that makes an eyelet hole. yrn, p2tog: yarn round needle - as yfwd but for purl stitches. Sl 1, k1/k2tog, psso: slip 1, knit 1/k2tog, pass the slipped stitch over, (you decrease 1 or 2 sts). The original yarn was standard double knitting with good yardage of 126 yards (115 meters) - so you may need 3 balls of the main colour if substituting. I think it is very awkward to put a small baby into trousers in the conventional way. Many of these vintage baby patterns from the 1980s have leg openings which I think are much more practical, so I adapted this pattern. I chose buttons but you can apply press studs if you think that is safer. Row 1: K3, *P3, K3; repeat from * to end of row. Row 2: P3, *K3, P3; repeat from * to end of row. Work rows 1 and 2 in rib as before. (K1, yfwd, K2tog), P3, K3, (P1, yrn, P2tog), * K3, P3, (K1, yfwd, K2tog), P3, K3, (P1, yrn, P2tog); repeat from * once, K3. Work row 2 again, then row one, and cast off in rib.